Thanks to Dr. Shrinivasan, Sterling Hospital (India), for contributing this case. To contribute a Case of the Week, follow the guidelines on our Case of the Week page. (1) To improve our quality control, we are requiring Case of the Week contributors to get the diagnosis confirmed by another pathologist before submitting the case. Also, we welcome contributors from outside the US, but US Tax Law requires us to withhold 30% of the payment ($15 of $50) to send to the US government, so we will only send you $35. We will also send you some tax forms in February of the next year, that may enable you to get a refund of this $15 withholding. (2) We are starting to post a new Apharesis section in the Transfusion Medicine chapter, written by Huy Phu Pham, M.D. and Garrett S. Booth, M.D., M.S. (3) Our Home Page has a new Mystery Case on the right hand side. (4) Yesterday (11 Feb 2014), we had record traffic of 21,725 visits. Last month (January 2014) was our second best month for traffic, with 506,367 visits. Thanks for your support! Click on the Website statistics button on the left side of the Home page or click here for more information. 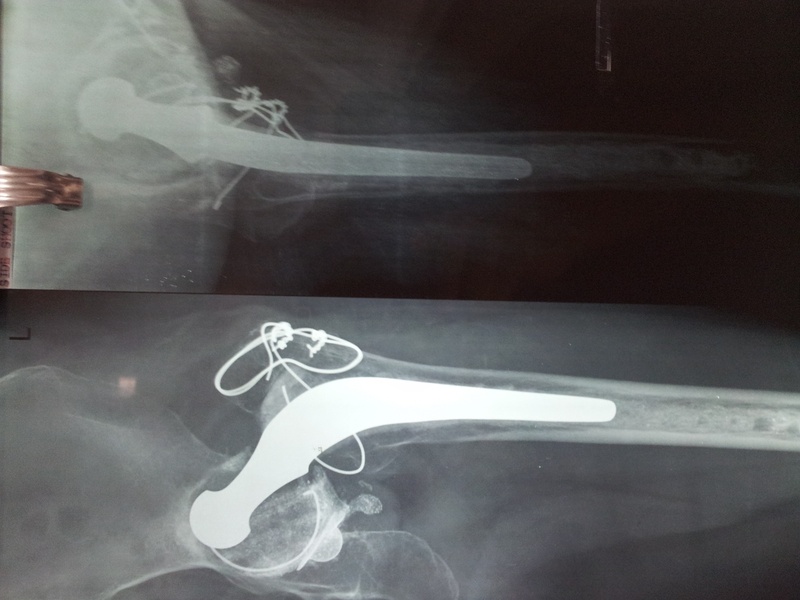 A 61 year old woman presented with a loosening of her total hip replacement (THR) prosthesis after a fall. She had a prior THR done 30 years ago. 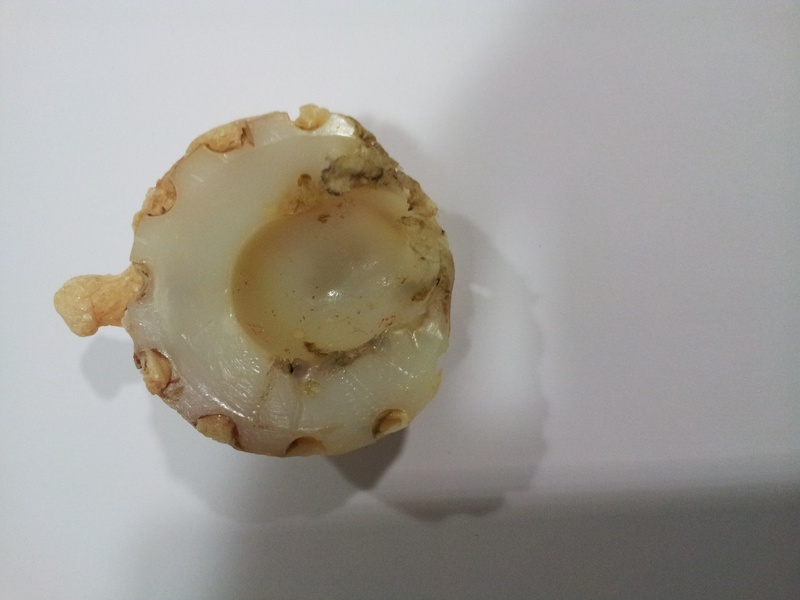 Soft tissue from the acetabulum was removed and sent for histopathological examination. Microscopy showed implant related changes of sheets of foamy histiocytes, epithelioid cells and numerous multinucleated giant cells. 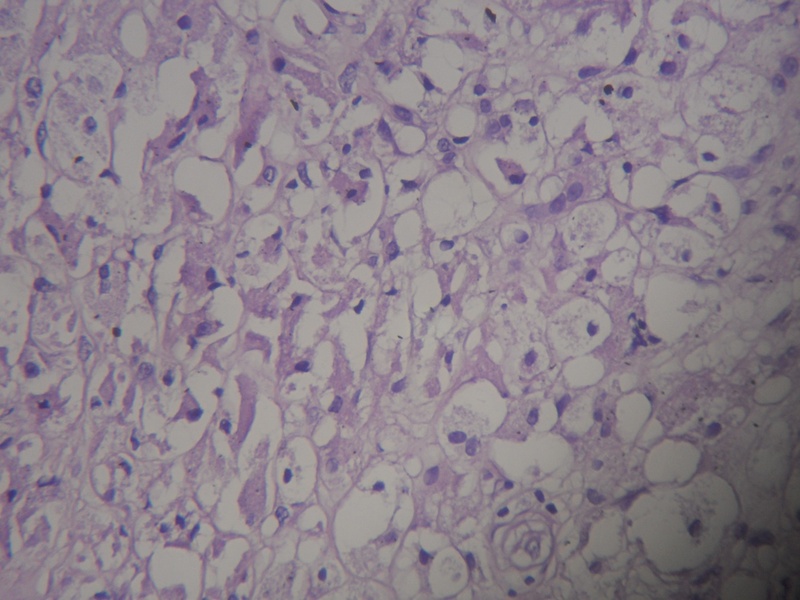 Many of the giant cells show angulated clearing in the cytoplasm. Polarizing light showed crystal-like structures consistent with polyethylene particles. In total hip replacement, aseptic osteolysis and subsequent implant failure occur because of a chronic inflammatory response to implant-derived wear particles (Clin Orthop Relat Res 2007;460:240). Polyethylene particles, which are part of the joint bearing surface, are phagocytized by macrophages and foreign-body giant cells in periprosthetic tissues around joint replacements, initiating an osteolytic cascade (Z Orthop Ihre Grenzgeb 2000;138:522). Macrophages not only produce cytokines involved in osteolysis, but are precursors for osteoclasts which themselves cause bone resorption (Biomaterials 2005;26:1271). 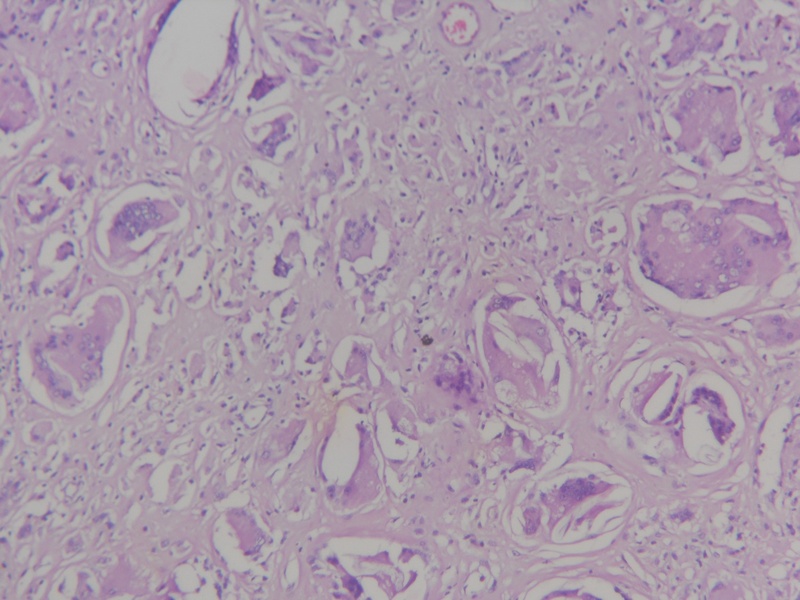 Polyethylene fragments are needle-shaped, and are found in foreign body giant cells. They are typically small, and may be overlooked unless polarized microscopy is used (Am J Clin Pathol 2000;114:773). Larger fragments of polyethylene are green-yellow with H&E staining. Metallic debris may also be present. Actual crystals can be associated with arthropathy. 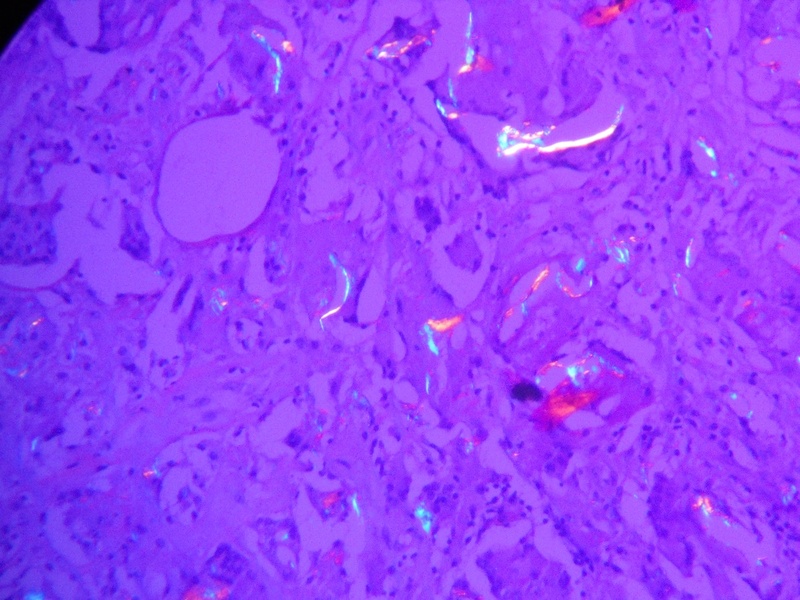 Calcium pyrophosphate crystal deposition disease, also called pseudogout or chondrocalcinosis, is due to calcium pyrophosphate dehydrate crystals which develop first in menisci and intervertebral discs, and then may seed the joint and elicit a neutrophilic response, leading to significant joint damage. The knee is a common site, and 50% have involvement of multiple joints at diagnosis. Histology shows small rectangular (rhomboid) crystals that are weakly positive birefringent, with a variable histiocytic and giant cell reaction around the crystals. Gout and gouty arthritis cause transient attacks of acute arthritis due to crystallization of urates and neutrophils, followed by chronic gouty arthritis with tophi in joints and urate nephropathy. 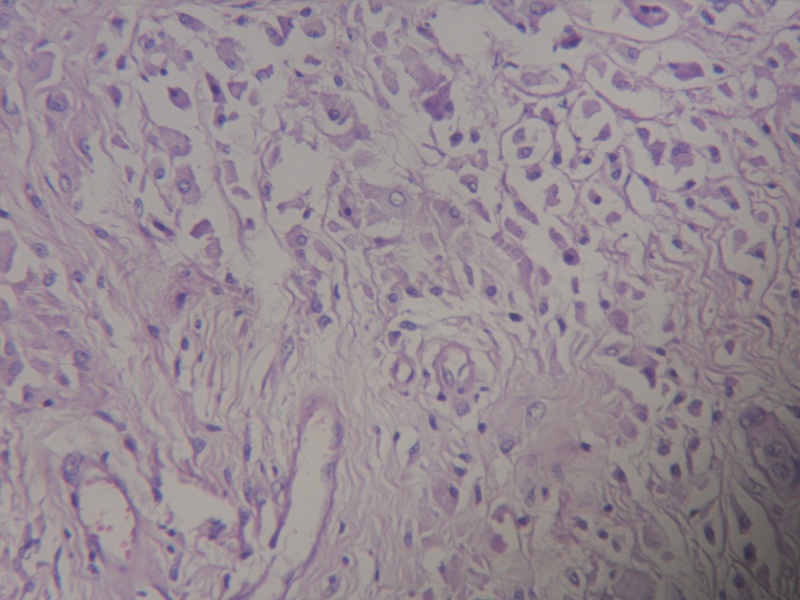 Early histologic findings are edematous synovium with an acute and chronic inflammatory infiltrate. Late findings include tophi, large aggregates of urate crystals, granulomatous inflammation and hyperplastic fibrotic synovium. The gout crystals are long, slender and needle shaped, but they are difficult to visualize with routine staining because they are water soluble and dissolve during formalin processing.